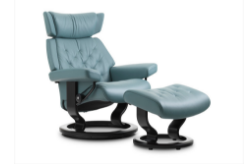 Stressless Skyline Medium Recliner with Ottoman with Classic Base- Relax and Unwind Now! Why not add an accessory to your Skyline medium? Choose one of the following accessories: the ultra-convenient Personal/Laptop Table, the useful Ellipse Table, the stylish Urban Table, or the fan-favorite Elevator Ring set. 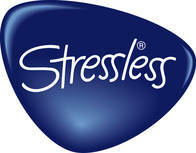 Enjoy Fast, Worry-free Delivery on a Stressless Skyline Medium Recliner with Classic Base and Ottoman. Choose from a wide variety of leather or fabric type and colors by simply using the pull down menu above, which is titled: "Select Leather or Fabric Type and Color". Then choose from the beautiful wood stains. Typically, we keep all stains in stock.